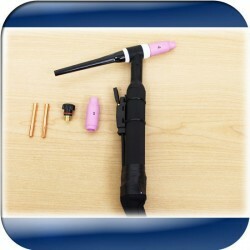 Air cooled Tig welding torch with 4.5M cable. Welding current 150Amp at 60% duty cycle. Used for welding alloyed steels, aluminium, magnesium, copper and their alloys, grey cast iron, bronzes, nickel, silver, titanium, lead and unalloyed steels. 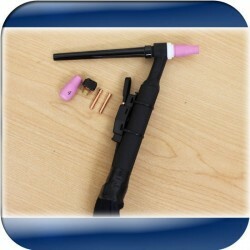 Air cooled Tig welding torch with 4M cable. Welding current 200Amp at 60% duty cycle. Used for welding alloyed steels, aluminium, magnesium, copper and their alloys, grey cast iron, bronzes, nickel, silver, titanium, lead and unalloyed steels. Water cooled Tig welding torch with 8M cable. Welding current 250Amp at 60% duty cycle. Used for AC and DC current applications.